General Electric Stock History: Will Shares Ever Return to Record Highs? GE has a long success story, but it's still working hard to recover from changing times. The idea that led to an industrial giant. Image source: Getty Images. 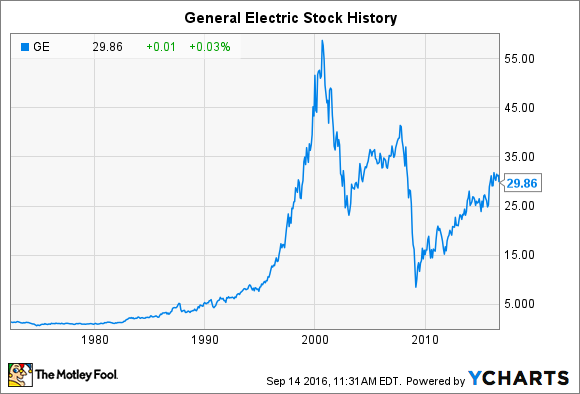 Electricity is something most people take for granted now, but General Electric (NYSE:GE) traces its history all the way back to the invention of the electric lightbulb. Created from a merger that included Thomas Edison's commercial enterprise, GE went on to become the premier industrial giant in the U.S., and its stock was one of the strongest performers of the 20th century. Yet, more recently, General Electric has faced challenges that have held its stock price in check, and some wonder if it can ever grow enough to regain its past heights. Below, we'll look at General Electric's stock history with an eye toward determining whether the conglomerate's best days are behind it or still to come. The chart above gives you a sense of General Electric's rise over the past half-century, but it doesn't fully do the industrial giant justice. The company was among the first components of the Dow Jones Industrial Average index, and it has been a continuous member of the Dow for more than a century. The stock has produced a long-term average return of roughly 10% since its public offering in 1892. When you look at the behavior of General Electric's stock price, you can see a clear break in the pattern. Through 2000, GE enjoyed incredible growth, taking full advantage of the boom times of the 1980s and 1990s. In late 2000, General Electric hit its peak market capitalization, exceeding $600 billion. The upward trend had begun in the 1980s. With the arrival of Jack Welch as CEO in 1981, General Electric started making strategic moves that sent the company in new directions, such as the acquisition of RCA and the NBC television network in 1986. More importantly, the period featured the expansion of the GE Capital division to go well beyond industrial financing. The decline in General Electric stock during the bear market of 2000 to 2002 was largely in line with the drops that the overall market posted, especially among the better-performing stocks, in the previous decade. Yet of some concern to investors was the fact that GE never regained the levels it had reached during the tech boom. By the time the Dow had set a new record high, General Electric shares were still down by a third from their all-time highs. The full downside of the GE Capital strategy became obvious during the financial crisis in 2008. The size of the capital division had grown to such an extent that it dominated the rest of the company, providing the majority of profits for the overall enterprise. That was fine when things were going well. But when liquidity dried up in the marketplace, General Electric found itself in trouble, and it took billions of dollars in capital raising from Warren Buffett and others in order to provide some confidence in the unit's viability. General Electric also slashed its dividend, ending a streak of 70 years of not having to endure a payout cut, and hurting many dividend investors in the process. In the years since the financial crisis, General Electric has moved away from financial innovation and instead returned to its industrial roots. In industries like renewable energy, aerospace, oil and gas, and healthcare, General Electric has emphasized its ability to make vital products that lead to major advances. That has helped the stock price recover, with shares having tripled since GE's low point during the financial crisis. The conglomerate has also made moves to divest non-core businesses that it sees as not being as important to its long-term success. The sale of NBC marked an important step for General Electric, and efforts to reduce its exposure to the financial industry by selling off assets have largely put GE Capital back in its rightful place in playing a supporting role. Looking forward, General Electric has the capacity to keep growing over time. With the stock still 50% below its peak level, GE probably won't reach new all-time records anytime soon. However, if the global economy finally picks up steam in the near future, then some of the strategic moves that General Electric has made to try to bolster its presence as a global industrial giant should begin to pay off for the company.